The landscapes, especially, have a grandeur and immediacy to them that stops you in your tracks. And it’s not the plein air pieces, so full of the energy, that strike you. No, it’s the big ones. So often, enlarging a smaller painting results in a loss of the energy of the original work. However Dunphy did it, whether by creating a new composition by using multiple sketches as the source material or what, she has given the larger pieces a different kind of energy: less visceral, perhaps, but more intense. I overheard another artist at the opening say, as the highest compliment he could pay, “I wish I’d painted this.” Well—me, too. I’ve long maintained Dunphy is an incredibly generous teacher. She was also generous with visitors at the opening. The 30 or so people who attended last Saturday afternoon got to hear Dunphy describe how she uses her small plein air sketches as source material for her larger pieces. Her stories of trying to catch the light before the fog engulfed the view, or heading out for trip to the Sierras and forgetting all but one brush, helped give each painting a life beyond mere canvas. They also helped her listeners understand a bit of what it’s like to be a painter. It’s also nice to see all the red dots at the exhibition. But then, most of Dunphy’s paintings sell. So if you’re interested, act quickly. 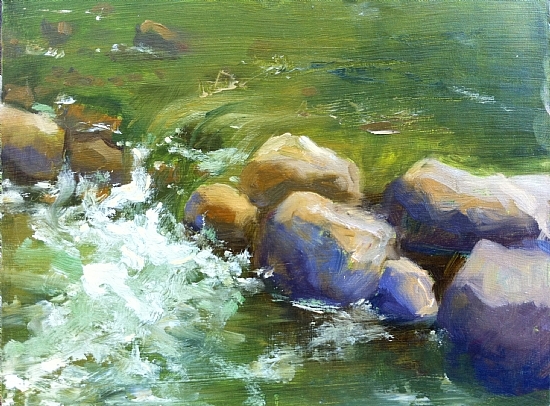 Ebb and Flow: Painting Nature’s Rhythms is at Knowlton Gallery in Lodi through November 24, 2012. Full disclosure: I am an associate artist member of the California Art Club, and my painting was not accepted for this show. The California Art Club finally came to the greater Sacramento area in the fall of 2011, when it established its Greater Sacramento-Sierra Chapter. Although the club is over 100 years old, it had never had an inland northern California chapter before. (And already the chapter has more than 90 members!) To celebrate, the club is currently holding its inaugural exhibition for the chapter, Rivers of Gold, at the Bank of America Gallery at Three Stages, at Folsom Lake College, east of Sacramento. South Fork-Cosumnes River by Annie Fountain. Oil. 6″ x 8″. Used by permission. On display in Rivers of Gold through September 2. This is, as expected, a very strong show. 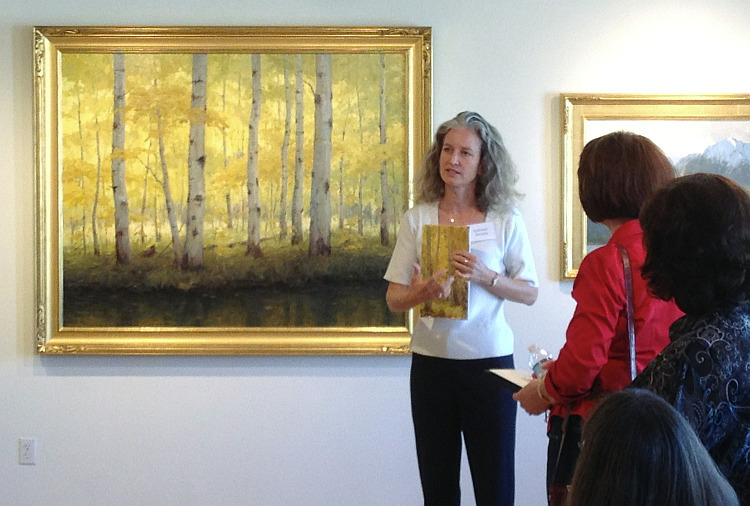 The California Art Club is dedicated to supporting traditional painting and sculpture—that is, representational art. Rivers of Gold, themed around the rivers of Northern California, showcases 17 artists and about 25 paintings in styles that range from semi-abstract to very traditional tonalist works to impressionist styles. Many are plein air pieces, though not all. The artists represented include some well-known painters, such as Kathleen Dunphy, Susan Sarback, and Michael Knepp, to newcomers Annie Fountain, Tatyana Fogarty, Jane Welles. (I wonder if it’s significant that there are 5 men and 12 women represented in this show.) It’s great to see so many excellent pieces from around our region all showing in one place. The gallery itself is fairly new. It’s part of the Three Stages complex in Folsom, which opened only in 2010 or 2011. The gallery space is quite small, a triangular room tucked between the building’s exterior wall and an interior wall surrounding one of the theaters. While I’m glad to have another art gallery in the region—the space could use some sound muffling. The maybe 50 people who attended the reception July 21 filled the space with the kind of din you get at modern restaurants, where you almost need to shout at your companions to be heard. I am sure that lots of attention went into the acoustics for the theaters, but it seems they overlooked this gallery space. And the gallery is open very limited hours. So if you’re planning a visit—and I do recommend the show—be sure to check the website or call first, to make sure it’s open. Rivers of Gold runs through September 2, 2012. Update: added link to the letter. Regal. 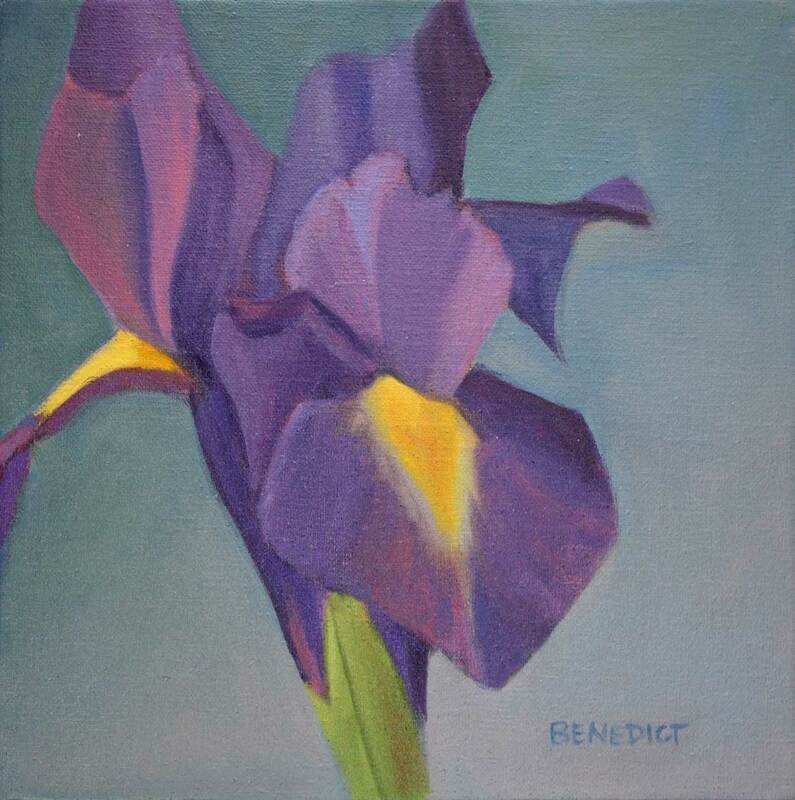 ©2012 Stephanie Benedict. 12 in. x 12 in. Oil on linen. For me the most important point in the piece is not that the 0.01% will pay stratospheric prices for a handful of artwork by dead artists–of which, of course, there will never be any more than there are now–but the very end of the article: most people create and purchase art because they like it. There is a vastly different art market out there from the one that Davidson describes: galleries featuring living, working artists in all sorts of mediums; art fairs; artists showing their work on line. People will plunk down $200 for a new phone or $700 for a tablet that lasts, what, 3 years? Or $20K for a car that might last 10? A thing of beauty is a joy forever: and it may only cost $300 or $3000. Collect art because you love it. And if it turns out to increase in value over time: you can tell people how insightful you were to get it! Adam Davidson is right: if you’re part of the 0.01%, the economy has been great these past five years. But for more commonly I see galleries struggling, artists chattering about whether or not they can raise their prices at all—or should they actually drop them, and whether that’s a mistake in the long run. Arts organizations sponsor events in which they raffle off artwork; my local PBS station has a major fundraiser every year that’s an art auction, in which artists donate work and in return receive 5 minutes of air time, but no commission. The local art museum also has an art auction every year, but at least they give the artist a portion of the sale price. But those events serve to reinforce the idea that art should be a bargain. So we have two extremes: on the one hand, local arts organizations or non-profits can foster the impression artwork can and should be inexpensive (never mind that the artist has to make a living). On the other, the press going on and on about how a very few can pay enormous sums of money to purchase artwork. What do you think? Why do you collect art—or why don’t you?